We’ve all heard of Hanoi, Hoi An, Halong Bay and Ho Chi Minh City in Vietnam, it’s the four places which receives the most tourists. Although they’re all worth visiting, it can sometimes be overwhelming with the amount of foreigners in these areas. If you’re longing to go to a place that’s still quite untouched, has a unique vibe to it and offers tourists a more relaxing atmosphere, you must go to Phong Nha! It’s deemed to be the next big backpacker destination in Vietnam and rightfully so. Let’s explore beautiful Phong Nha. Phong Nha has been developing rapidly so there’s a ton of places to choose from nowadays. One of the newest hostels is called “Central Backpackers Hostel”, located conveniently in the city center of Phong Nha. Walk along the same road and you have the famous “Easy Tiger Hostel – Jungle Bar”, which is the place to stay at if you want a so-called party hostel with a lively atmosphere. If you’re looking for something more calm, check out SY’s Homestay which is located a bit outside of the city center, but has a lovely pool and a relaxing ambiance. There’s a lovely new vegan restaurant in the city center of Phong Nha called “Veggie Box” that serves Instagram worthy smoothie bowls, sushi, and other delicious plant based food. 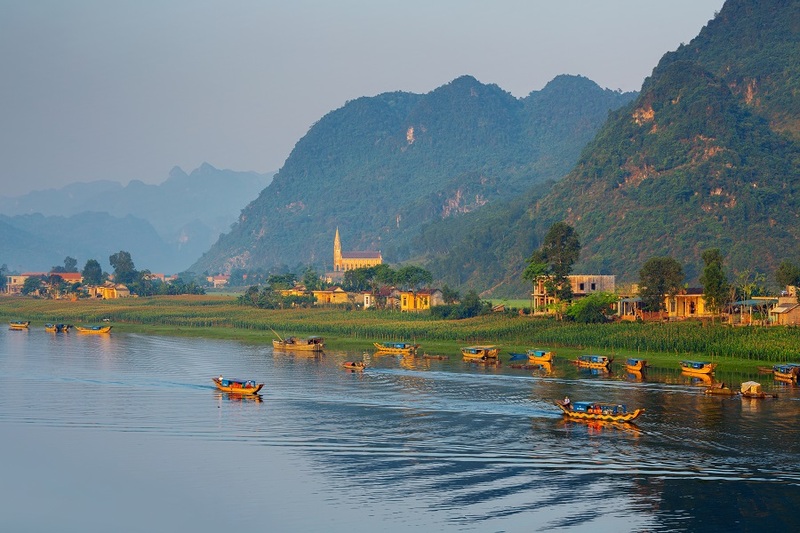 The prices are very affordable too, which probably has something to do with the fact that Phong Nha still hasn’t become a popular tourist destination. The best thing to do when you’re visiting Phong Nha is to rent a scooter. The roads are safe to drive, there’s little traffic and a scooter will get you to your destination faster. You can also rent a bicycle, but the distances are far of you want to go to the caves. What you should do when you’re in Phong Nha is to visit Dark Cave, Paradise Cave and Phong Nha Cave. If you want something more adventurous, go to the Dark Cave where you can go zip lining and do obstacle courses in the water. But if you really want something spectacular, you must try to visit Son Doong cave, also known as the largest cave in the world. It’s difficult to understand how big it is, but imagine a cave where you can fit an entire New York City block, with 40-stores skyscrapers and where you can fly 747 in the largest cavern. If you want to be able to see this wonder, you’ll have to be willing to pay up. It costs US$3,000 per person for a five day, four night expedition with Oxalis, but it’s very much worth the price. However, even if you are willing to pay the hefty price, the expedition tours are usually sold out a year in advance, so if you really want to visit this cave, make sure to book well in advance. People are always looking for new places to visit that are also more unexplored. Thanks to the caves in Phong Nha, people started to get more drawn to this sleepy little city and nowadays it’s become quite an established backpacker destination. Along the Main Street, you’ll see dozens of hostels, homestays, cafés and restaurants that are aimed at tourists and even bars. Although it’s not as full as other places in Vietnam but it’s on the rise. Now is the time to go to Phong Nha, before it gets completely taken by tourism. People want to experience a more calm, rural landscape, that still feels very Vietnamese. It also helps that the roads are very calm here and you can cruise in your scooter amongst majestic mountains and rice fields. It’s a beautiful destination that hasn’t gone unnoticed by foreigners and locals alike, and it’s just a matter of time before rumors spread about this sleepy town and it will become the new hot spot. .
Before you think about traveling to Vietnam, you must apply for a Visa. You have three options, depending on your nationality: either you get a Visa on Arrival, E-Visa or go to your nearest Vietnamese Embassy or Consulate. The first option is the most preferred one amongst travelers, because almost everyone can apply for it. All you need to do is fill out an online form, wait for your visa confirmation letter, print it out and present it to the immigration officers in Vietnam with a photo of you and money. That’s it! It’s so simple, fast and affordable. However, acquiring a visa on arrival is only possible if you’re planning to fly in to Vietnam. If you’re going by land, you have to apply with the Vietnamese Embassy or Consulate.